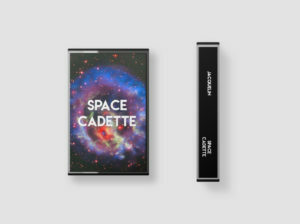 We are happy to announce that tapecassettes.com has it’s first original cassette tape release available on preorder here: Jacquelin Releases The artist is the creator tapecassettes.com, who produced this concept album, based on NASA sounds and recordings from a galaxy near you. In addition to the cassette, physical copies receive a mini colored one page comic book. There is a limited number to 60 cassettes available galaxy wide. The image above is a mock of final product which is in mass production from a professional duplication plant.